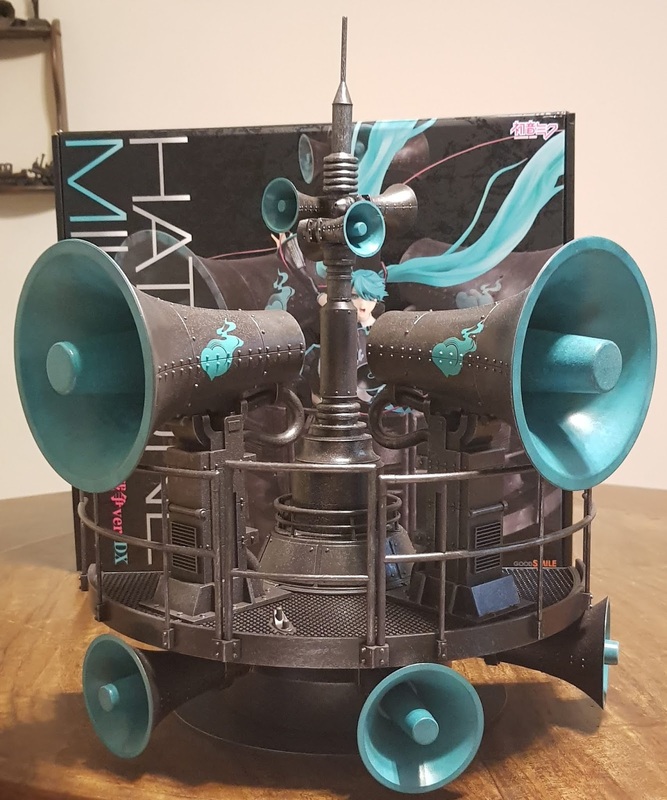 If the previous assembly post didn’t convince you that this holy grail is a masterpiece and worth every cent, this review definitely will. 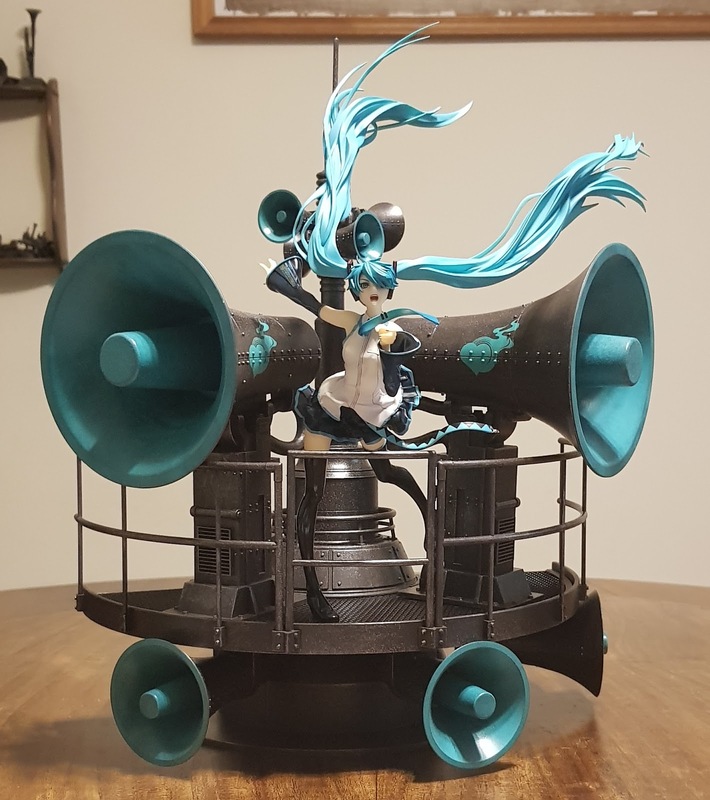 There’s so much to point out about this work of art, especially the details on the base! The texture is amazing. It looks exactly like the one represented in the music video, and all the rivets in the structure are just to right size so they are visible but neither misplaced or overpowering. 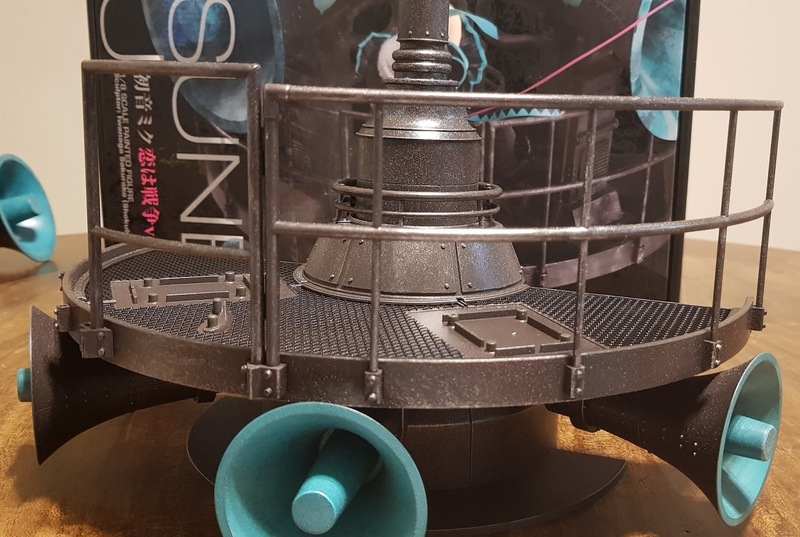 The same metallic paint is also applied on the railing, right down to the hinges – which is definitely a very nice touch to the figure, making it look as realistic as possible! The insides of the large microphones are painted with Miku’s teal, making the color palette of this figure largely dark grays and teal. 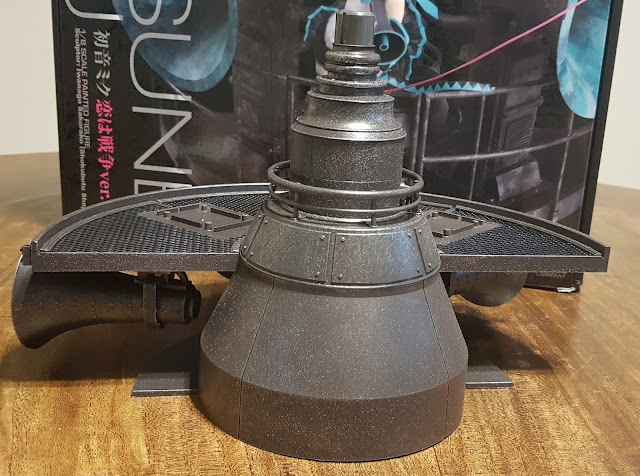 This might be a very simple color palette compared to other newer figures (such as NGNL) but this simplicity makes it an eye-catching centerpiece for all collections! 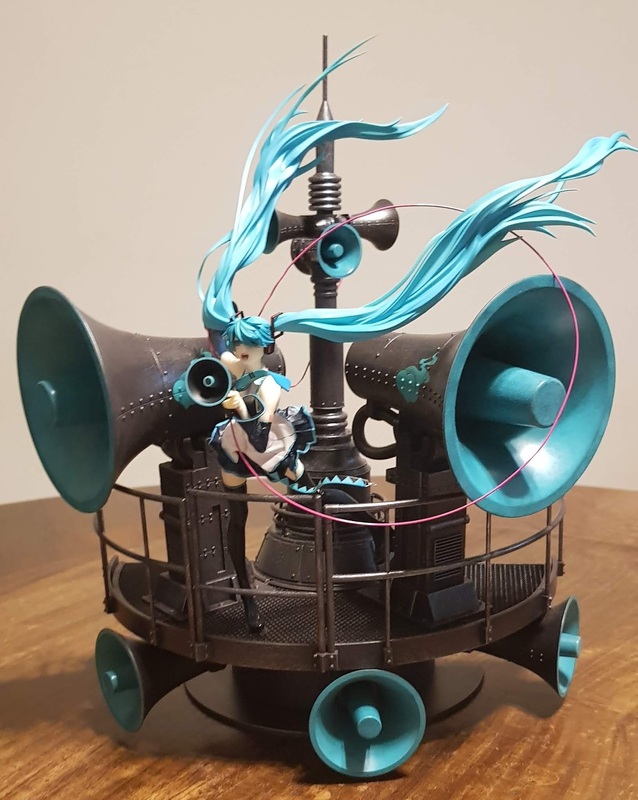 It would definitely stand out with its color scheme and design among a display of vibrantly colored figures, and on the other hand, it would mesh in nicely with figures with subtle color schemes too! 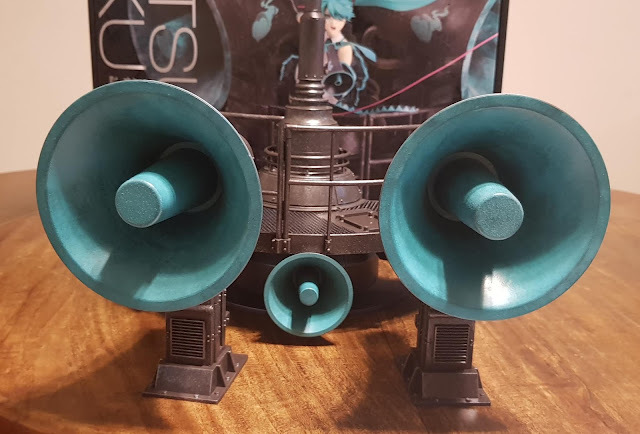 The teal in the microphones also have a marbling effect, which adds dimension, variation and depth to an otherwise bland color scheme. 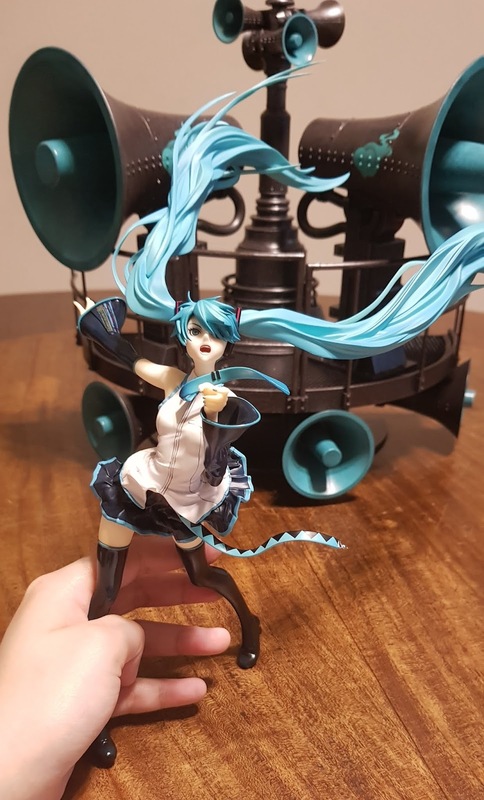 Likewise, Miku herself is the pinnacle of dynamism in this figure. It feels like her pigtails billowing out behind her were sculpted to cover any blank spaces between the different parts of her base, and as such helps to pull these distinct blocks together to form a scene in her MV. 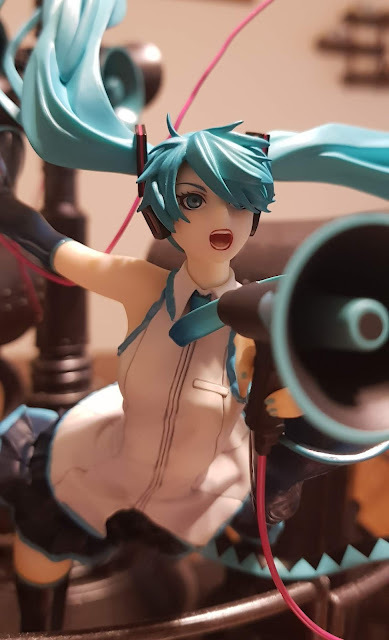 Her facial features aren’t the best, as this is a rather old MV and sculpt, but the expression is on-point. You can really feel her determination and frustration burning in her eyes! Her pose also helps to put the point across with her fiercely yanking the microphone forward, and thus twirling the pink cord behind her. I would have loved if they went for a more iconic look, where she stomps one foot down on the railing and yells into her microphone, but I suppose with figure technology back then, that would have been too prone to develop leaning issues. 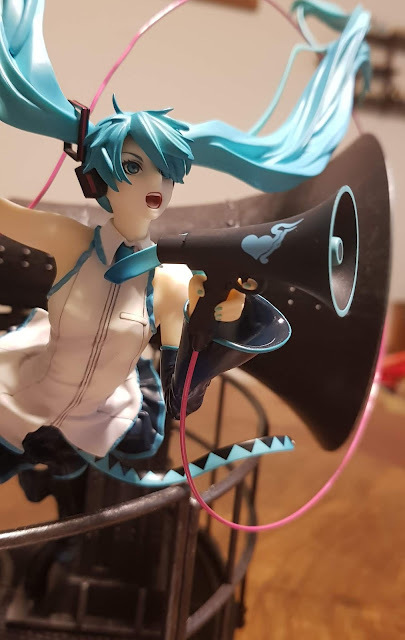 A very huge gripe I have with the figure would be the pink microphone cord. 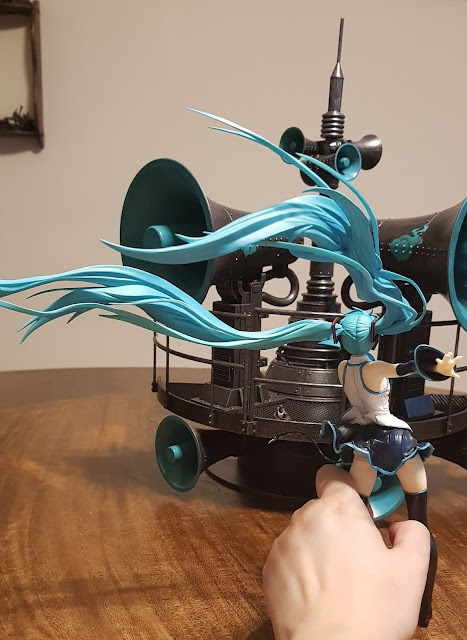 Firstly, this is constructed using a wire which is very malleable and once it goes out of shape, it is very difficult to get it back to a perfect round shape (which is seen behind Miku in the prototype). The issue with this is that GSC only provides 1 wire, so you can either get it right the first time or berate yourself for life. Secondly, there doesn’t seem to be a hole where I can slot the other end of the wire (the one not connected directly to the microphone) and it’s not mentioned anywhere in the instruction sheet or in any prototype photographs. 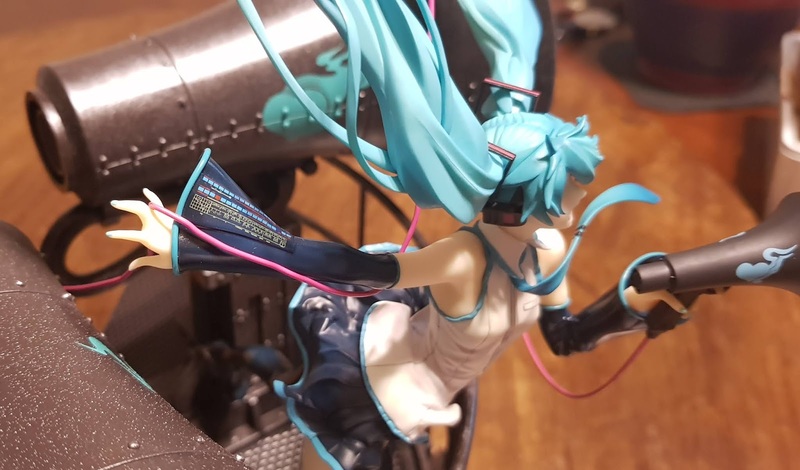 No Comment to " Figure Unboxing and Review: Hatsune Miku - LOVE IS WAR version "